VANCOUVER and PLEASANTON, CA, August 29, 2016 – Ritchie Bros. Auctioneers Incorporated, the world’s largest industrial auctioneer and a leading equipment distributor (NYSE & TSX: RBA, “Ritchie Bros.”), and IronPlanet®, a leading online marketplace for used heavy equipment and other durable asset sales, today jointly announced that they have entered into an agreement under which Ritchie Bros. will acquire IronPlanet for approximately US$758.5 million, subject to customary closing adjustments. Founded in 1999, IronPlanet complements Ritchie Bros.’ primarily end-user customer base, as it focuses largely on the needs of corporate accounts, equipment manufacturers, dealers and government entities in equipment disposition solutions. It conducts its sales primarily through online-only platforms, with weekly online auctions and in other equipment marketplaces. IronPlanet, a private company based in the United States, sold approximately US$787 million of Gross Merchandise Value (GMV) through their sales channels during 2015, and has achieved a 25.2% compounded growth rate in assets sold from 2013 through 2015. This growth momentum has continued, with a 41% increase in GMV during the first half of 2016 relative to the same period in 2015. “This is an exciting day for IronPlanet, our customers, employees and shareholders. IronPlanet joining forces with Ritchie Bros. will allow the combined company to deliver a multi-channel marketplace that will provide a full range of equipment asset management and disposition solutions. IronPlanet has built a leading online marketplace and technology platform across a number of verticals, and when combined with Ritchie Bros.’ strength in live onsite auctions, will prove to be a powerful combination in driving value for our customers,” said Gregory J. Owens, Chairman and Chief Executive Officer of IronPlanet. Creates a more valuable marketplace and expands addressable market. Customers will benefit from a larger marketplace with more buyers and sellers, as well as a greater number of choices and services. As an example of the value the combined company’s multi-channel transactional platforms and greater scale can deliver, Ritchie Bros. also announced today that it has entered into a historic, long-term strategic alliance with Caterpillar, which will significantly strengthen its relationship with Caterpillar dealers. Ritchie Bros. will become Caterpillar’s preferred global partner for live onsite and online auctions under the agreement, which will take effect upon completion of the IronPlanet acquisition. The addition of IronPlanet provides Ritchie Bros. with access to new, large customer segments, including government surplus and oil & gas. Furthermore, the wider range of sales solutions offered by the combined company will allow it to more effectively meet customer preferences in many key international locations, including the U.K., Germany, Japan and China – where Ritchie Bros.’ established infrastructure will provide a platform to launch IronPlanet solutions. Strengthens digital capabilities to provide enhanced levels of customer service. The combined entity will have an integrated technology platform to provide customers with more tailored solutions that meet their needs and enhance the overall customer experience. These solutions, including multiple dealer portal options, valuable business intelligence, amplified data analytics and multiple online sales channels, position the combined company to provide comprehensive asset management solutions. Together, Ritchie Bros. and IronPlanet are better positioned to cater to evolving consumer preferences, with more transactions being conducted online. Collectively, Ritchie Bros. and IronPlanet (on a pro forma basis) sold more than US$3.0 billion of assets through online transactions during the 12 months trailing June 30, 2016 – ranking the combined business among the world’s top 50 B2B e-commerce companies, based on value sold. Expected to deliver long-term growth and profitability. The transaction is expected to be accretive to earnings within the first year (excluding transaction costs) and significantly bolster growth in Gross Auction Proceeds (GAP), revenue and earnings over the long term. The combination will also enhance the generation of free cash flow, which will enable Ritchie Bros. to support strategic growth priorities, return value to shareholders and reduce debt. Presents tremendous opportunities to build on Ritchie Bros.’ business model and strong heritage. Ritchie Bros. and IronPlanet share a passion for serving customers and providing them with easy-to-use solutions. Bringing together Ritchie Bros.’ scale, geographic footprint and brand strength with IronPlanet’s complementary online models will offer customers more options to move more of their inventory across multiple sales channels. Transparency and a customer focus will continue to be the cornerstones of the combined company, as it leverages best practices from both organizations, including IronPlanet’s successful inspection and IronClad Assurance® equipment condition certification. Under the terms of the transaction, Ritchie Bros. will acquire 100% of the equity of IronPlanet for approximately US$740 million in cash and the assumption of unvested equity interests in IronPlanet, subject to adjustment, that brings the total transaction value to approximately US$758.5 million. This represents a 13.0x multiple of IronPlanet’s 2017 Estimated Adjusted EBITDA, inclusive of the expected $100 million net present value of tax synergies and $20 million in run-rate cost synergies. Ritchie Bros. intends to finance the transaction through a combination of cash on hand and new debt, and has bridge financing commitments from Goldman Sachs Bank USA subject to customary terms and conditions to facilitate the transaction close. Following the close of the transaction and the required financing, Ritchie Bros. is expected to have a net debt to EBITDA ratio of no more than 3.0x. Ritchie Bros. has secured employment agreements with key executives, who will supplement the strength of Ritchie Bros.’ global management team. Mr. Owens has agreed to join the combined company’s executive committee upon closing. Goldman, Sachs & Co. is serving as financial advisor to Ritchie Bros. and Skadden, Arps, Slate, Meagher & Flom LLP and Dechert LLP are serving as legal advisors. J.P. Morgan Securities LLC is serving as financial advisor to IronPlanet and Orrick, Herrington & Sutcliffe LLP is serving as legal advisor. Ritchie Bros. and IronPlanet will host a joint conference call to discuss the announcement tomorrow, August 30, 2016, at 5:30 am Pacific time / 8:30 am Eastern time / 1:30 pm BST. A replay will be available shortly after the call. 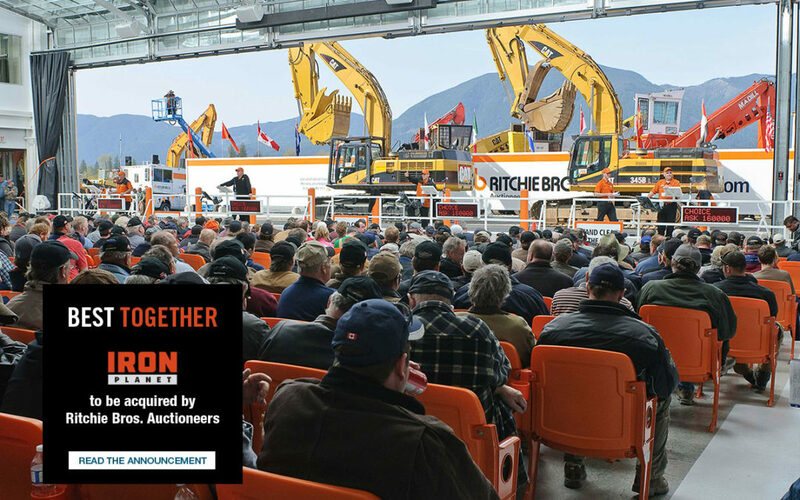 Established in 1958, Ritchie Bros. (NYSE and TSX: RBA) is the world’s largest industrial auctioneer, and one of the world’s largest sellers of used equipment for the construction, transportation, agriculture, energy, mining, forestry and other industries. Ritchie Bros.TM asset management and disposition solutions include live unreserved public auctions with on-site and online bidding; EquipmentOneTM, an online auction marketplace; Mascus, a global online equipment listing service; private negotiated sales through Ritchie Bros. Private Treaty; and a range of ancillary services, including financing and leasing through Ritchie Bros. Financial Services. Ritchie Bros. has operations in 19 countries, including 45 auction sites worldwide. Learn more at rbauction.com, EquipmentOne.com, mascus.com, rbauction.com/privatetreaty and rbauction.com/financing.